There's a great tradition in the White House on St. Patrick's Day. 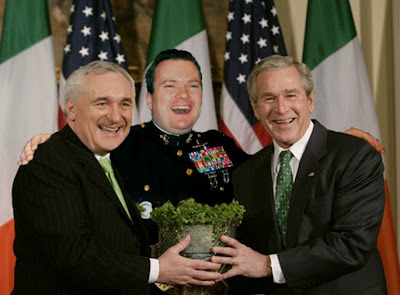 Our Taoiseach, in this case the great Bertie Ahern, (far from the treasonous antics of the whining muppets in opposition back in the Dáil) makes a journey to meet with the President of Freedom and Glory, in this case George W. Bush and presents him with a Waterford Crystal bowl of Shamrock. This year was the final year in which Bertie would present it to George but hopefully next year President McCain will uphold this great tradition. 2 Lovable rogues and a muppet! Which one is which though??? Tell me Colonel, Did the 'wonderful' George doubleya look for the leprechans in the shamrock? Maybe Darby O Gill with the Hollywood Irish accent was lurking in a corner with King Brian???? That I have to admit is a terrifying image on so many levels!